On Friday and Saturday, November 10-11, Regent University’s Undergraduate Debate Association (RUDA) put on an impressive performance at American Moot Court Association’s regional tournament hosted by Regent University’s School of Law. One of the RUDA teams made it as far as the quarterfinals, and claimed another victory over Patrick Henry College in the tournament final. In January, the finalist and quarterfinalist RUDA teams will move on to compete in the National Moot Court Tournament in Dallas, Texas. 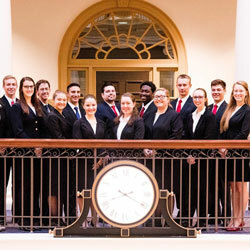 Regent’s teams competed against 43 others from Virginia colleges and universities, including the University of Virginia and the College of William and Mary. Wollum said the experience gave her a greater confidence to pursue attending law school, and praised the team’s coach and Regent University School of Law adjunct professor Jess Krentz, crediting their success to Krentz’s “encouragement” and how she points the team members towards the example of Christ. In addition to successful teamwork, individuals within the team received recognition for their stellar work and performance. Kana Turley ’21 (CAS) was awarded 1st in Best Oralist, and Samuel Lillemo ’19 (CAS) received 3rd place for the same.